I captured this rose January first this year. I thought it would be fitting for a post that contains a few lists over this year – the first full year of the lady dandelion blog. As you can see the single most read post is the review of the Montblanc Meisterstück. It continues to have several reads every week, which has surprised me a little. It beats its competitors in a very convincing way. I’ve also collected some of my favourite pen/ink/paper posts from the past year (by others – not me) and finally a little list over various blog posts/articles that – by various reasons – are well written and worth to read. I have most definitely forgot few or many great articles and reads, but these are a few of those that have caught my attention. They are listed in a random and arbitrary order – no hierarchy intended. Diamine Registrar’s Ink – the blue black? This entry was posted in fountain pens, inks, paper, pens, photo, writing and tagged lists, new year, paper, pens. Bookmark the permalink. You are most welcome. 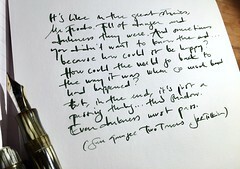 I am a fan of your ink reviews – in particular the poetical quotes you find for each ink.